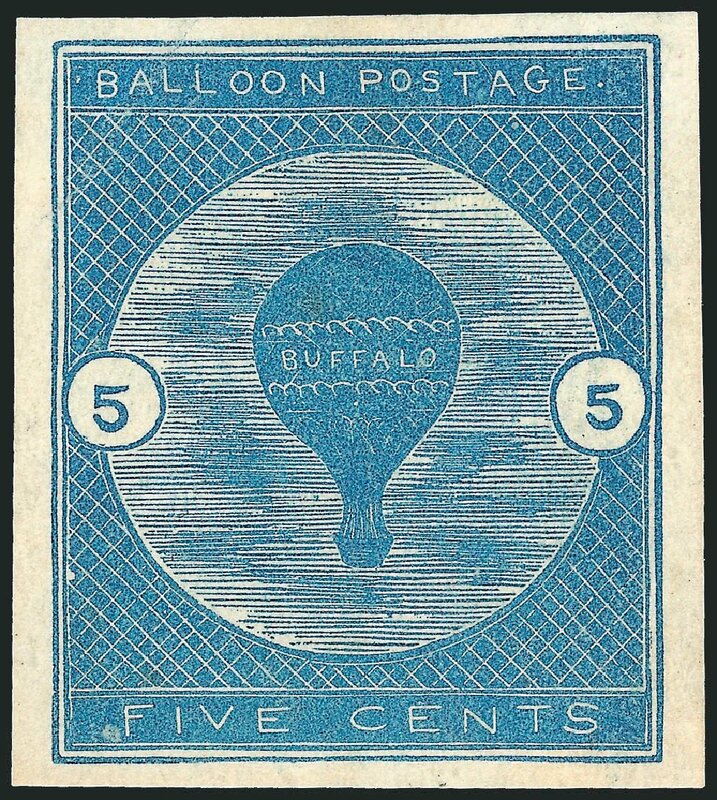 USA (Scott CL1a) 1870 BALLOON 5¢ BLUE SEMI-OFFICIAL AIRMAIL, TETE-BECHE PAIR RARE tete-beche pair of the World’s First Airmail Stamp, one of only about a dozen known! Pair has extremely fine centering, with large margins all around, but with crease between stamps (torn about 11mm), and thin on bottom stamp (not unusual on pairs), as well as couple of other tiny faults. 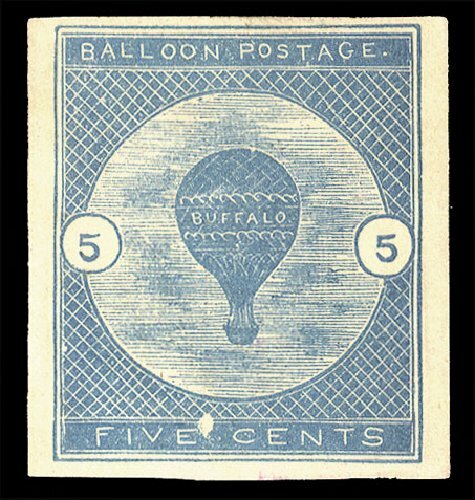 The Buffalo Balloon stamp was designed by John F.B. Lillard and was engraved by John H. Snively. The stamps were printed by Wheeler Brothers in Nashville, Tenn., in tete-beche pairs. The stamps were intended for use on a flight of the ‘Buffalo’ from Nashville to Gallatin Tenn., June 18, 1877. Of 300 printed, only 23 were used. Missing from all but a lucky few collections. Ex-Jim Czyl. (1977 Friedl Cert #11149, signed by Bloch). Cat $22500. 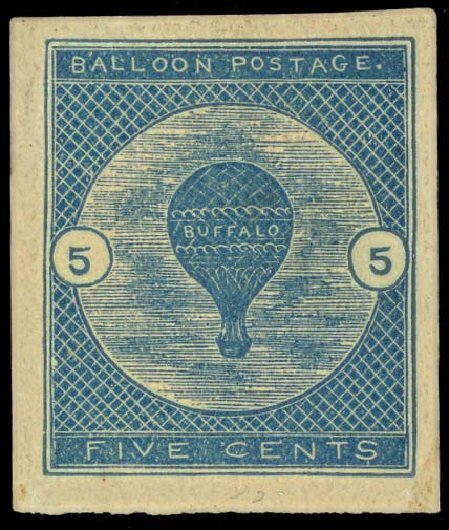 5c Deep Blue, Buffalo Balloon (Scott CL1). Original gum, h.r., large margins, rich color, few thin spots, light corner crease at top right VERY FINE APPEARANCE. 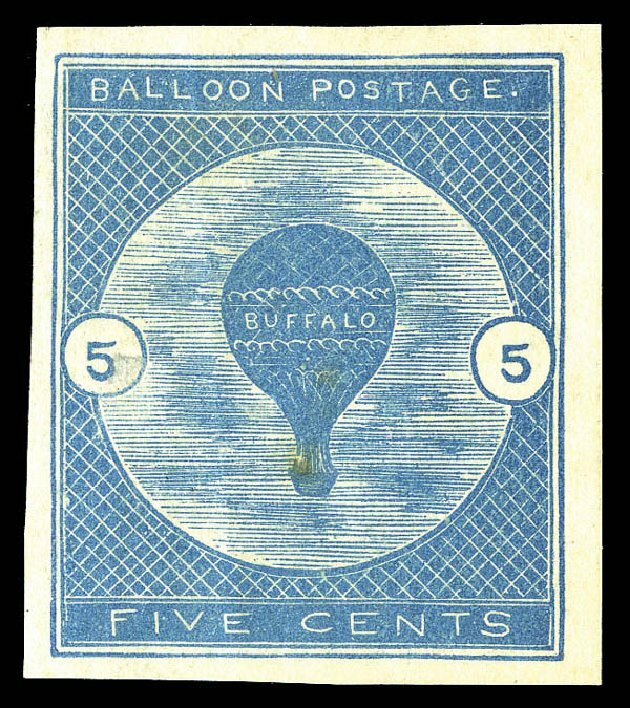 A RARE EXAMPLE OF THE BUFFALO BALLOON AIR POST ISSUE. 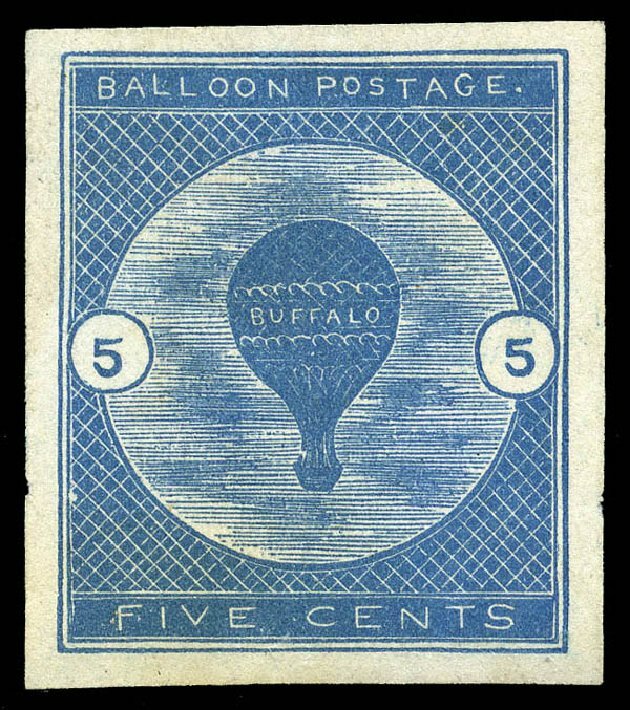 The Buffalo Balloon stamp, designed by John F. B. Lillard and engraved by John H. Snively, was printed by Wheeler Brothers Printers in Nashville, Tenn., The stamps were intended for use on a balloon flight from Nashville to Gallatin Tenn., which took place on June 18, 1877. Of the 300 that were printed, only 23 were used. 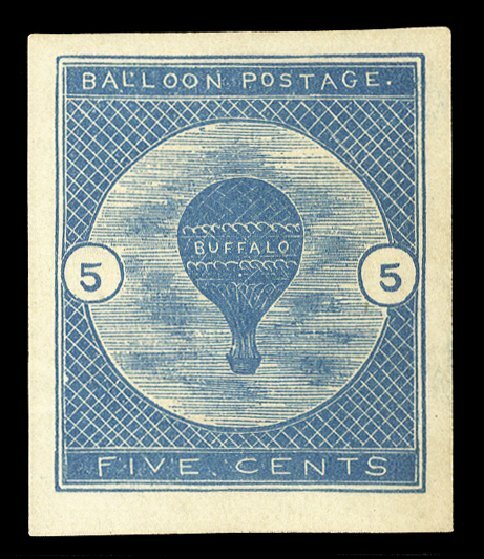 Airmail Semi-Official, 1877, 5¢ Buffalo Balloon (Scott CL1), extraordinary example of this rare stamp, exceptionally large margins and gorgeous rich color, among the most impressive examples you’ll ever see, o.g., previously hinged; minute thin speck at upper left, Extremely Fine, only 300 printed. Scott $7,500. Estimate price $5,000 – 7,500. 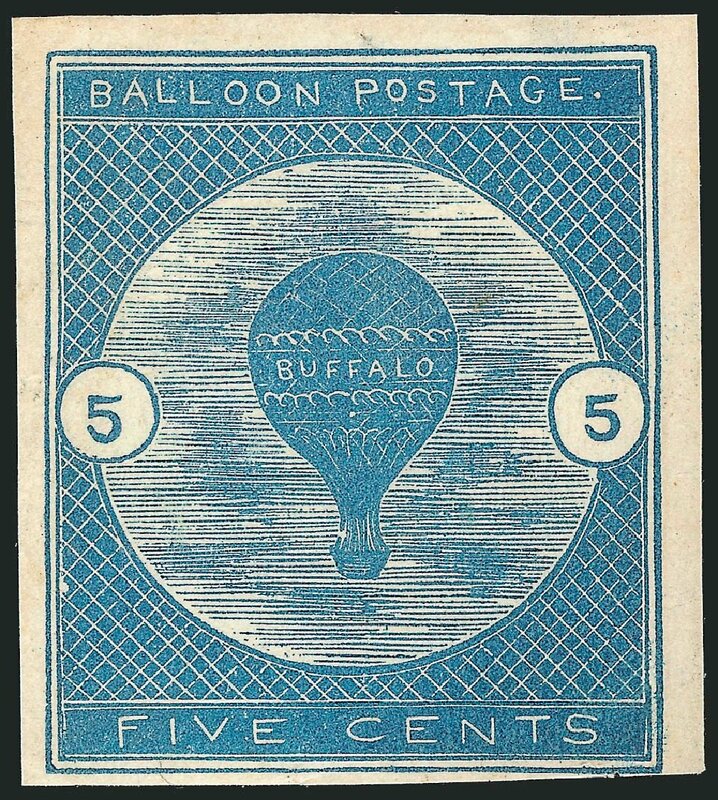 Airmail Semi-Official, 1877, 5¢ Buffalo Balloon (Scott CL1), without gum, lovely example of this extremely rare stamp, with spectacular deep rich color, a premium affordable example of this rarity; faint horizontal wrinkle shows only in fluid, Fine, only 300 actually printed. Scott $7,500 for o.g. Estimate value $2,000 – 3,000. 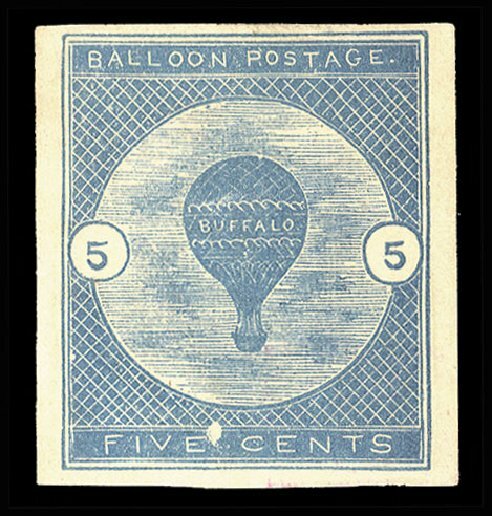 Scott #CL1a, 5c Deep blue “Buffalo Balloon”, tete-beche pair, an extremely rare unused example of this pair, without gum as is often the case with these stamps, extraordinarily well margined, with huge balanced margins all around, there are just a couple of trivial facial rubs and light wrinkling between the pair in the margin only, these small flaws are quite trivial considering not only the extreme rarity of the pair, but the majority of the few other surviving tete-beche pairs have faults much more severe than the pair offered here, extremely fine appearance; of particular interest is the wide variance of color between each stamp in the pair, with one having a light “milky” blue shade, while the other is a deep blue shade. 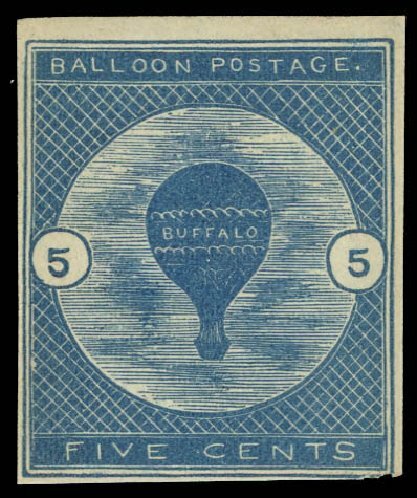 These fascinating “Buffalo Balloon” stamps were intended for use on a balloon flight from Nashville to Gallatin, Tennessee, which took place on June 18, 1877. It is believed that only 300 stamps were printed, of which only 23 were used. We believe that only twelve to fifteen tete-beche pairs still exist today, of which most have been certified by the Philatelic Foundation. Nearly all existing examples have small faults and/or are without gum, suggesting that the original sheets may have been stacked and exposed to moisture prior to their sale; ex-Cunliffe. 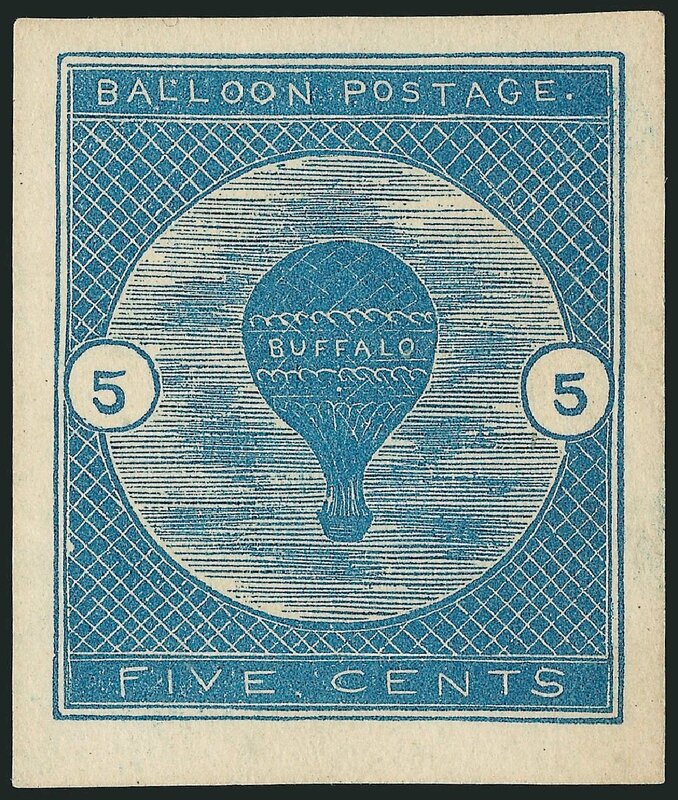 Airmail Semi-Official, 1877, 5¢ Buffalo Balloon, tête-bêche (CL1a), vertical pair, types II and III, 6mm spacing, large to huge margins all around, o.g., top stamp with a light corner crease, still fresh and Extremely Fine. Scott price $22,500 A CHOICE EXAMPLE OF THIS RARE TÊTE-BÊCHE PAIR, OF WHICH ONLY ABOUT 11 ARE KNOWN, VIRTUALLY ALL OF WHICH ARE FAULTY TO SOME DEGREE. Expertization: 2009 P.F. Certificate.